David Cameron’s ideas on the Big Society are not new. But every few months he has to renew our understanding of his big idea…the Big Society. You’ll remember that he toyed with the idea in the Cameron new society speech for the 2010 election. And has returned several times. It’s not because the idea is terribly complex. And, of course, it’s not that he’s lost us somewhere. So his Big Society speech yesterday (14th February 2011) had to make that clear. No, the problem is that as political theories go, this one is rather vague. Now that might not be a bad thing. However, it’s still vague. The Prime Minister’s Big Society speech yesterday was as much a question and answer session as a formal speech. In fact the questions and their answers occupied as much time, if not more, than the speech itself. So far, so good. 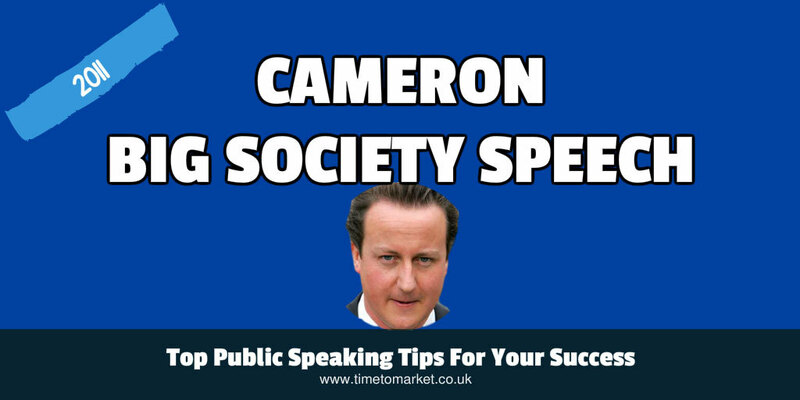 The introduction to his speech underlined how people are talking about the Big Society. And of course that’s a good thing. Most people don’t discuss a politician’s big ideas. but, the Big Society is different. Because it does inspire discussion. whether it is broken families or whether it is some communities breaking down; whether it is the level of crime, the level of gang membership; whether it’s problems of people stuck on welfare, unable to work; whether it’s the sense that some of our public services don’t work for us. Take crime: yes, government’s got a huge role. We’ve got to put the police on the streets, we’ve got to make sure the sentences are there, and we’ve got to make sure that prison places are available–that is our job. How easy is it, if you are not satisfied with education, to club together and start up a new school? It’s incredibly difficult. But that was it. A speech without a great deal of structure and without many signals on progress. But he saved up the best part of his speech for the end. So with that, let’s go to the first question. Who wants to kick off? He wanted feedback on his big society idea. And he got it. And that was probably far more important than a grandiose or posturing speech on this occasion. Of course you can discover plenty of public speaking tips with our posts, podcasts and videos. And with 100 top tips for speakers and presenters, there’s something for every occasion. But, when you want a more focussed approach to your public speaking skills, don’t forget that a training course can well be the way to go. because a well-timed training intervention can really boost your confidence and skills levels. So, when the time is right, please don’t hesitate to get in touch.